﻿ Philippians 2:16 Holding forth the word of life; that I may rejoice in the day of Christ, that I have not run in vain, neither laboured in vain. Hold firmly the message of life. Then I can boast in the day of Christ that I didn't run in vain or labor for nothing. as you hold firmly to the word of life. Then I will be proud when the Messiah returns that I did not run in vain or work hard in vain. Holding firm the word of life, for a boast by me in the day of Christ, that I did not run in vain nor labor in vain. holding forth the word of life; that I may have whereof to glory in the day of Christ, that I did not run in vain neither labor in vain. Holding out [to it] and offering [to all men] the Word of Life, so that in the day of Christ I may have something of which exultantly to rejoice and glory in that I did not run my race in vain or spend my labor to no purpose. as you hold out [i.e., offer to people] the message of [never ending] life. Then I will have something to boast about on the day of Christ's [return, See 1:6], that I had not run the race for nothing nor had worked for nothing. holding forth the word of life, that I may rejoice in the day of Christ, that I did not run in vain, nor labor in vain. Offering the word of life; so that I may have glory in you in the day of Christ, because my running was not for nothing and my work was not without effect. holding fast the word of life, so that in the day of Christ I may be proud that I did not run in vain or labor in vain. you, who display the doctrine of eternal life) that in the day of Christ I may have the satisfaction of not having pursued my laborious course in vain. holding forth the word of life, so as to be a boast for me in Christ's day, that I have not run in vain nor laboured in vain. having the word of life; unto my boasting in the day of Christ, because I did not run in vain, neither did I labor in vain. offering men the message of life. Then I will have reason to boast of you on the Day of Christ, because my exertion and labor have not been wasted. 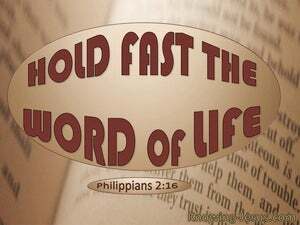 Holding fast the word of life, that I may glory in the day of Christ, that I have not run in vain, neither laboured in vain. 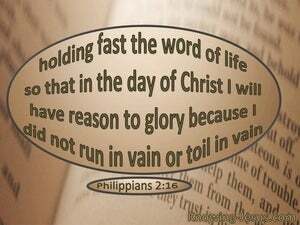 holding fast the word of life, that I may glory in the day of Christ that I have not run in vain, neither laboured in vain. Holding on to the word of life; for boasting to me in the day of Christ, for I ran not in vain, nor was I wearied in vain. Holding forth the word of life; that I may rejoice in the day of Christ, that I have not run in vain, neither labored in vain. holding fast to the word of life, for a source of pride to me in the day of Christ, that I did not run in vain or labor in vain. holding forth the Word of Life, so that I may rejoice with you in the day of Christ, that I have not run in vain nor labored in vain. holding fast the word of life, unto my rejoicing in the day of Christ, that I have not run in vain, neither have laboured in vain. hold fast the word of life, so that I can be proud of you on the Day of Christ, because I have not run or worked for nothing. holding out a message of life. Thus it will be my boast at the day of Christ that I have not run in vain, or toiled for nothing. by holding on to the word of life so that on the day of Christ I will have a reason to boast that I did not run in vain nor labor in vain. holding up the word of life; that I may have something to boast in the day of Christ, that I did not run in vain nor labor in vain. holding forth the word of life, that I may have whereof to boast against the day of Christ, that I did not run in vain, or labor in vain. holding fast the word of life, for my glorying in the day of Christ, that I did not run in vain, nor labor in vain. holding up the word of life, that I may glory in the day of Christ, that I have not run in vain, nor laboured in vain. Offering to men the Message of Life; and then I shall be able at the Day of Christ to boast that I did not run my course for nothing, or toil for nothing. holding out to them a Message of Life. It will then be my glory on the day of Christ that I did not run my race in vain nor toil in vain. to hold up the message of life. That will give me ground for boasting on the day of Christ, because neither my career nor my labor has been a failure. holding up the word of life; that I may have something to boast in the day of Christ, that I didn't run in vain nor labor in vain. holding forth the word of life, for an occasion of glorying to me at the day of Christ, that I ran not in vain, neither labored in vain. exhibiting the word of life; to my rejoicing in the day of Christ, that I have not run in vain, nor laboured in vain. 15 That ye may be blameless and harmless, the sons of God, without rebuke, in the midst of a crooked and perverse nation, among whom ye shine as lights in the world; 16 Holding forth the word of life; that I may rejoice in the day of Christ, that I have not run in vain, neither laboured in vain. 17 Yea, and if I be offered upon the sacrifice and service of your faith, I joy, and rejoice with you all. O God, thou hast taught me from my youth: and hitherto have I declared thy wondrous works. As also ye have acknowledged us in part, that we are your rejoicing, even as ye also are ours in the day of the Lord Jesus. For this cause, when I could no longer forbear, I sent to know your faith, lest by some means the tempter have tempted you, and our labour be in vain. Men and brethren, children of the stock of Abraham, and whosoever among you feareth God, to you is the word of this salvation sent.